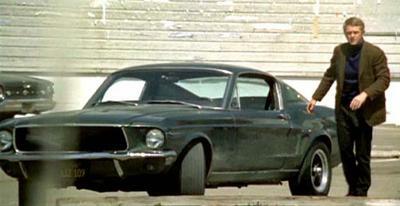 Steve McQueen and 1968 Mustang "Bullitt"
Do you know the measurement of the American mags on Steve McQueen's car in the Movie Bullitt? I have a 66 Ford Mustang coupe that needs some dressing up and I like those wheels.. I'd like to go to 15 inch by 7 or 8 in. Will they still fit under the car without modifications? From what I've seen, most people use a modified set of American Racing Torq thrust D wheels and then modify the look to resemble the ones used on the 1968 Ford Mustang fastback used by McQueen in the original movie Bullitt. Personal experience for the 1965 coupes and trying to find what fits, I would say that you can get away no problem with either 14x7 or 15x7 wheels. If you go to 8 inch rims, you will likely need to slightly "massage" the fender lip to prevent scuffing of the sidewalls of the tires or your Bullitt wheels. I've tried both ways and most of the time without modifications you'll be OK, but unless you work to keep them out of the wheel wells by lifting the car a bit, you probably won't be happy without pulling the lips in a bit. The professional way, is using a special tool designed to gently roll the lip inward, like you see on a Boss 302. But if you are careful, you may be able to get away with gentle bending along the radius using locking pliers. Just remember to bend it in stages from one end to the other. If you try to get the bend done in one go, chances are, you will either make major ugly bend marks on the fender lip. I've also seen people do a version of this with the edge of a 2x4 and a hammer, or a plastic hammer, but I wouldn't trust myself to not miss! I was talking to the manager of a better tire and rim store recently and he told me that if a customer is serious about a rim, he prefers to pull a wheel off and put a rim on the hub to get a good feel for how it's going to fit. Maybe you have one of these stores around your area and can check out the fit before committing to one size or the other.